Star Wars 9 begins shooting tomorrow. And we're already starting to get plenty of leaks and spoilers. But John Boyega may have beaten fellow Disney star Tom Holland when it comes to showing fans things he's not supposed to. The actor, who returns as Finn, posted a seemingly innocent photo to his Instagram. But in doing so, he's shown fans Finn's new look in the movie. And it's sure to be divisive. In posting the photo in question, Boyega was welcoming new cast member Naomi Ackie. She is one of the few African-American actresses to be included in a Star Wars movie. We don't know who she is playing. Her casting was announced last Friday, when Disney and Lucasfilm made their big production announcement for the sequel. We can't see Naomi hardly at all in the photo. Oh, but Finn's new hair? John Boyega says this in posting the image. "Welcome to a whole new world Naomi Ackie." 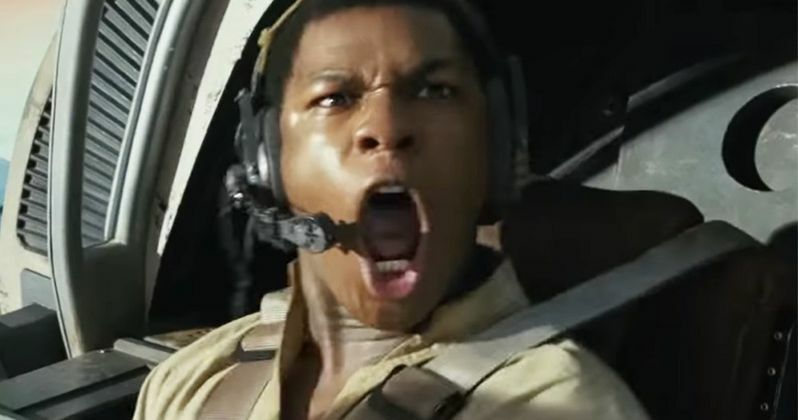 It has been known for quite some time that Finn is getting a drastic make-over in Star Wars 9. But we didn't realize it would be this big of a change. This final chapter in the Skywalker saga begins with a huge time jump from the end of The Last Jedi. Finn's hair isn't the only thing changing. While he might keep Poe's old flight jacket in his space closet, dusting over the sleeves and sniffle-hugging it in his best Ennis Del Mar impersonation, the guy's finally getting a new wardrobe of his own this time around. Poe is also getting some new clothes. Though as shocking as Finn's new hair might seem right out of the gate, it's supposed to be Daisy Ridley's Rey who really takes our breath away. She is getting an extreme makeover that is not like anything fans have ever seen before in the franchise. What that means, we have no idea just yet. While Rey, Finn and Poe have shared a handful of scenes between The Force Awakens and The Last Jedi, they've been kept mostly separated for those sequels. Star Wars 9 will bring them together for their final adventure. And it sounds like they'll be returning to that old Rebel base on Yavin IV, which was seen in A New Hope and Rogue One. This Rebel base camp will be attacked, presumably by Supreme Leader Ren and the First Order. But it doesn't sound like the gang will get split up. It sounds like Rey and Finn will be spending a lot more time with each other. So what does that mean for poor Rose Tico? She'll be shunted off to the sidelines, and we could see one very jealous member of the Resistance. Wouldn't it be fun if she went full on psycho and started stalking and tormenting Rey? That would make for a very interesting sequel. So far we haven't heard of any Rose rumors, which has to come as a slight disappointment to the biggest Rose Tico fan in the world, James Graves of Medford, Oregon. You thought we were going to say...Ah, never mind. That little one's not worth the effort. Anyway, you can get a good glimpse of what Finn is going to look like in Star Wars 9, and it's...Well, it's interesting to say the least. John Boyega himself posted the image. Check it out, and decide for yourself. Too much. Or is it the hairdo that saves the Star Wars universe.